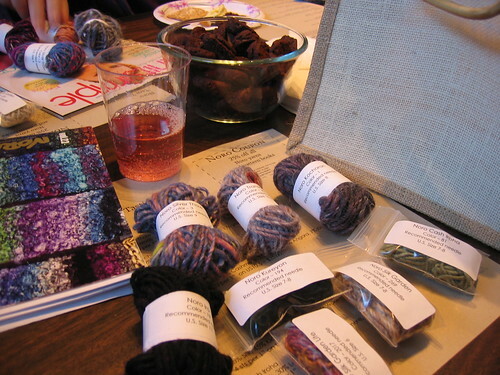 This was my first tasting and admittedly had no idea or plan-- the entire hour was just a free time to chat and knit, look at Noro books and knitted store samples, and plan out what we'd use our 25% all Noro purchases coupon for (I am hopelessly in love with SILVER THAW!!) Many of the women had been to samplings before and were working their yarn samples into large blankets/shawls, you'd be really surprised how well so many different yarns knit together can look! I'm actually really surprised how nice the colors work together, as oddly different as they are. 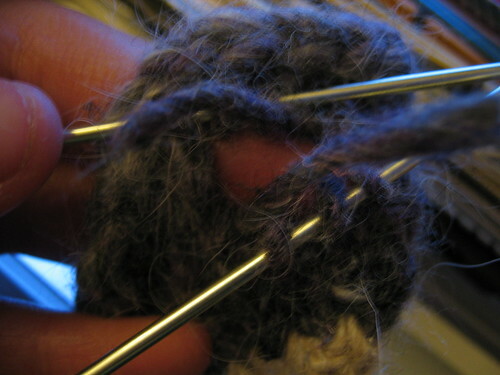 I did change needles when needed but the edges don't look too odd; it's much more noticeable laid flat than when worn.Even the different makeups of the yarns (from fluffy angora to smooth silk) work... perhaps it's just that Noro majic. 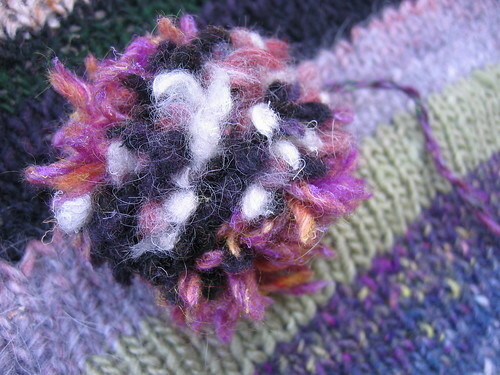 With the Silk Garden Lite (and the long ends of yarn left that wouldn't make it once more across the expanding triangle), I made a pom pon and lightly felted it to bring out some poufiness. I made it to attach to the caston tip that hangs in the back, worried it needed some weight to stay down-- but after a wet blocking, the kerchief is soft and didn't need any help. Good thing-- what was I thinking?! A pom pon. Goodness. Since the button closure was an afterthought, what better to do than Elizabeth Zimmermann's afterthought buttonhole? This was my first time (!!) and it's functional if not beautiful. Good thing my hair will obscure it from prying knitters' eyes :) If I were to knit this simple creature again, I'd just use a basic buttonhole instead of the afterthought. 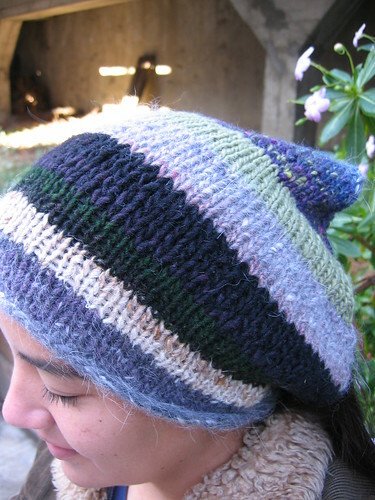 I actually think I will knit this again-- hats don't work for me, they just always look awful (my problem). The kerchief works to do everything I want a hat to-- keep my ears and forehead covered and my head insulated. I never thought much about the back of my head, I'll be sure to let you know if it gets cold ;) Seriously though, one ball of yarn and a few hours and you could have warm ears, too! And it's obviously a good scrap buster-- I think Christina said how much was in each sample, but I can't remember? (I zoned out, blame the brownies.) The entire thing weighs 50 gm (with the button), so I think you could easily use a single ball of splurge yarn on something like this. Now... what can I make out of Silver Thaw is the REAL question. Oh, I wish one of our local stores did that - it sounds (and looks) really cool. that sounds like a great event! I have some silver thaw stashed away to make a cardigan. I love the colors. Your kerchief is really sweet - I like the button idea. And thanks for the word on the sale. Silky Tweed, you say?? Fantastic. It makes me want to try a tasting myself. yes, fall in love with silver thaw. i made a wrap sweater out of it and i love it more than anything else i've knit. I've GOT to attend one of those yarn tasting! and your kerchief is a tasty one indeed. p.s. did you get my last email about sock designs? What a great idea. 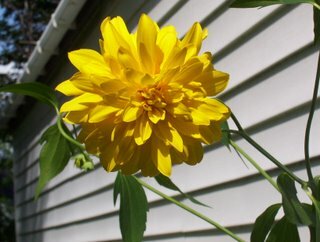 I wish my LYS had something like that. Even better idea to make the kerchief. Lovely kerchief; the yarn tasting sounds like so much fun. ps. I love you. You said pom pon. now that sounds like fun! a night of knitting Noro!! Great kerchief! 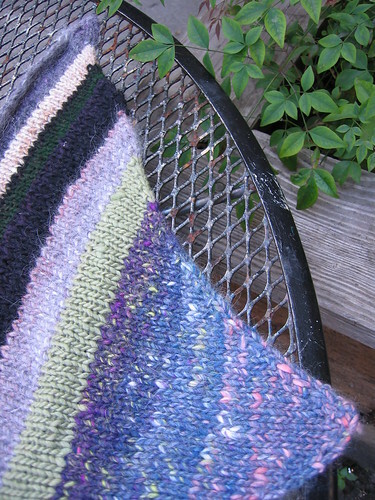 I held Silver Thaw double with Elsbeth Lavold's Silky Wool and made heavy socks knit tight. Over time they have felted slightly and wear like iron. Thanks for the great mention of the shop in your recent post.